Big things are happening for both you and the baby during the fourth week of pregnancy, even though you may still be completely unaware that you are expecting. 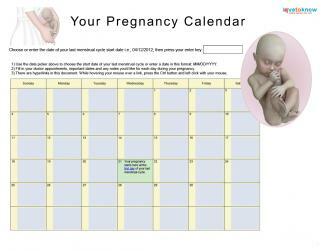 Since doctors count your pregnancy from the first day of your last menstrual cycle, your baby is actually only two weeks old when you are four weeks pregnant. By the beginning of the fourth week in your cycle, the fertilized egg has become a blastocyst, or a ball of cells. This ball has traveled down your fallopian tube and is getting ready to make itself at home in your uterus. This process, called implantation, involves the blastocyst burrowing in to the lining of the uterus, and it will happen over the course of this week. First, about seven days after conception, the blastocyst adheres to the lining of your uterus. The blastocyst stops moving and rolls until it finds a spot to attach. Over the next two to three days, the blastocyst moves deeper into the endometrium, or uterine lining. By the time the blastocyst is implanted completely, it will be fully buried. Around 12 days after conception, or toward the end of this week, the coagulation plug forms. 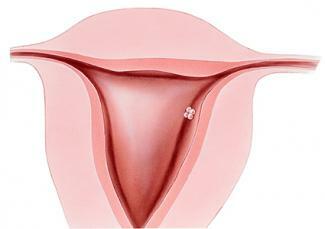 This closes the surface of the endometrium around the blastocyst, providing a snug place for it to grow. As it attaches to the uterine wall, the blastocyst undergoes some changes of its own. The cells within the blastocyst continue to divide and differentiate themselves. By the middle of this week, the blastocyst has two very different layers of cells. The outer layer will protect and nourish the baby, and the inner layer will continue to form into the embryo. As soon as it has made itself at home in your uterus, the blastocyst will begin to produce a hormone called "human chorionic gonadotropin" (hCG). This hormone will enter your bloodstream and will eventually reach concentrations high enough to be detected by a pregnancy test. As the blastocyst implants itself in your uterus, you may or may not notice a few symptoms. Not everyone experiences these signs, and it's entirely possible that you will feel that nothing is different. Bleeding is four or five days too early to be your period. Bleeding is very light, lasting only a few hours or a day. Spotting can be light red, light brown, or pale pink. Some women also report having cramps during the implantation phase of pregnancy. This feeling can be similar to light menstrual cramps, but it occurs a few days before you would normally get your period. On its own, this isn't a sign of pregnancy, but if you're also experiencing light spotting, it can further confirm your suspicions. However, if you notice severe cramping or bleeding, contact your doctor or midwife right away. This can be a sign of miscarriage or ectopic pregnancy. Whether or not you're experiencing symptoms, you may be able to test for pregnancy around the end of this week. Since the blastocyst begins to release hCG as soon as it implants, you can take an early pregnancy test to see if you can detect this hormone. Some early tests claim to be accurate up to four days before your period is due. However, if you receive a negative result with this test, don't worry. The hCG levels in your body will continue to rise, and you'll get a more accurate result after you've officially missed your period. While some women experience implantation bleeding and cramping, others don't have any sign that their lives may be about to change. Don't be concerned if you aren't noticing anything. Your body is changing in big ways, and soon your baby will make its presence known.